Half of Russian citizens consider current events in the southeast of Ukraine a civil war and more people fear an open military confrontation between Kiev and Moscow, a recent poll reveals. The VTSIOM public opinion center released the results of its latest research on the perception of Ukrainian events in Russia on Monday. Half of all respondents called the military standoff between pro-Kiev military and the self-proclaimed republics of Donetsk and Lugansk a ‘civil war’. Seventeen percent described the events as ‘terror and genocide’ (without specifying the side committing them) and another 17 percent perceived the events as ‘anarchy and banditry’. Three percent of Russians hold that Ukraine was experiencing a struggle for power between various political groups and another 3 percent called all that is happening ‘interference by Western nations’. 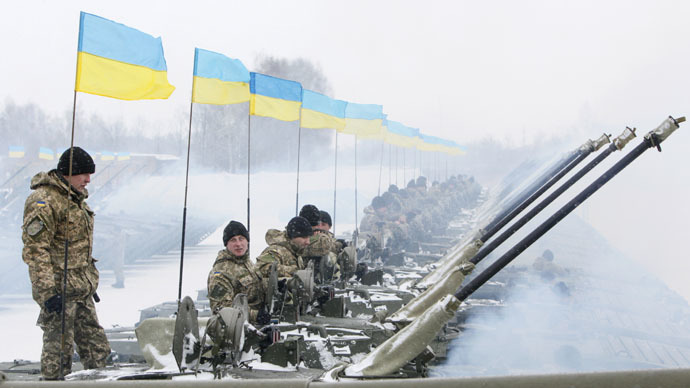 The general understanding of the situation in the neighboring country has deteriorated. Some 63 percent of respondents said they saw the continuing growth of tensions compared to 38 percent in October last year. The share of those who see the situation as stable has halved from 50 percent in October to 25 percent now. Only 4 percent of Russians claimed they had noticed some signs of improvement in the Ukrainian peace process. Twenty-six percent of those polled hold that the probability of a full scale war between Russia and Ukraine is very high, compared to 17 percent in October.However, 33 percent of respondents estimated the probability of such developments as very low and 21 percent said that it is completely impossible. A further 10 percent answered that in their view it is already underway. The head of the polling center, Valery Fyodorov, said in comments to business daily Vedomosti that the changes could be explained by the fact that over the past weeks the peaceful settlement between Kiev and federalists was interrupted by a new aggravation of the conflict. Political expert Aleksey Mukhin noted that the public expectations of an open military conflict between Kiev and Moscow were caused by Ukrainian propaganda statements that the war had already started as well as the recent Verkhovna Rada decision to recognize Russia as an aggressor. Last week, one of Russia’s senior officials, the head of the presidential administration Sergey Ivanov, told the press that Ukraine as a nation was serving more to the US interests and posed a colossal problem to Russia. “Russia is interested in Ukraine being a friendly, independent state that is capable of providing for itself. Today’s situation causes a great concern on our part. Poor, uncontrollable, legally incapable and insolvent Ukraine is a colossal problem for Russia,” Ivanov said. The official also noted that in his view, the chances for peaceful settlement of the Ukrainian conflict still exist, even though it was difficult to look at the situation with optimism. He added that peace could be achieved through the immediate ending of artillery raids and direct talks between Kiev and the self-proclaimed republics in Donbass.